1590 B.C. : Rahotep is more than a simple captain of the Nubian Desert Scouts. He is heir to the Nome of the Striking Hawk, which for over a generation has been under the harsh rule of the Hyksos. Accused of a crime he didn't commit and driven out of Nubia by the ascension of his scheming half-brother to the throne of Viceroy, Rahotep flees north to Thebes, accompanied only by a loyal band of Nubian archers. Here he takes refuge in the court of the Pharaoh Sekenenre III. Treachery, this time at the hands of murderous and power-hungry priests, throws Rahotep into a cell, deep beneath the Temple of Anubis. He must escape, not only to prove his innocence, but to join in a battle upon which hangs the freedom of Egypt. 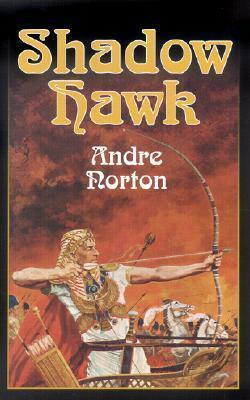 "Andre Norton finds her forte in this historical novel with "Shadow Hawk, an interesting and meticulously researched novel about the struggles of the Egyptians to drive out the Hyksos conquerors some two thousand years before the birth of Christ."